This skirt is so fun & unique! The a-line fit and soft, flat elastic waistband are comfortable and flattering. The champagne colored lace overlay is a perfect color match to the lining. The fabric gathers at the waist and flows beautifully down to the knees for a soft, pleated look. 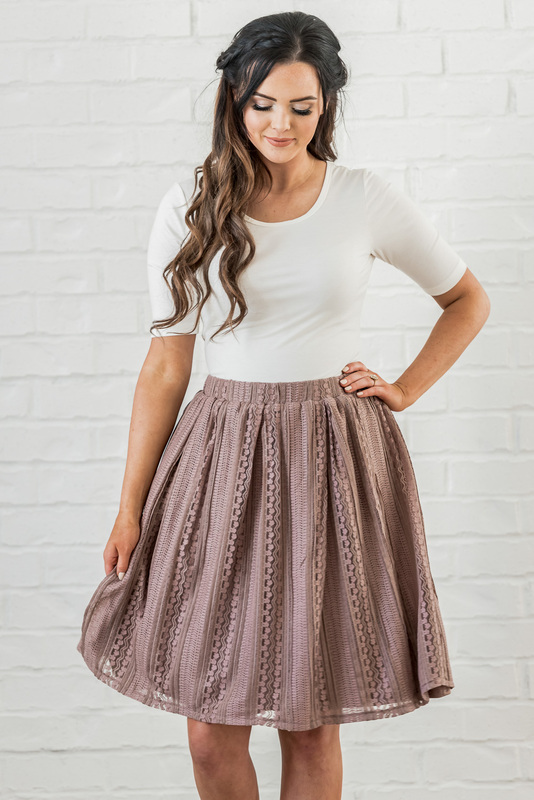 This skirt is perfect for date night, going to church, or as a unique option for bridesmaids! Worn here with our Drape Chiffon Top in Ivory and our Round Neck Top in Off-White. Total Length: XS-S 23", M-L 23.5", XL-XXL 24"